Phuket Soil Test Co., Ltd., we go forward by “Create Quality and Be Sure”. So that our service is emphasized on the Data & Information providing for the finest project. 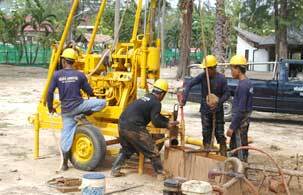 We offers Boring test on land and in the sea, foundation consultation, Plate Bearing Test, Pile Test and always serves by our 25 years experienced engineer team. Office: 09:00 AM. - 05:00 PM., MON.-SAT.